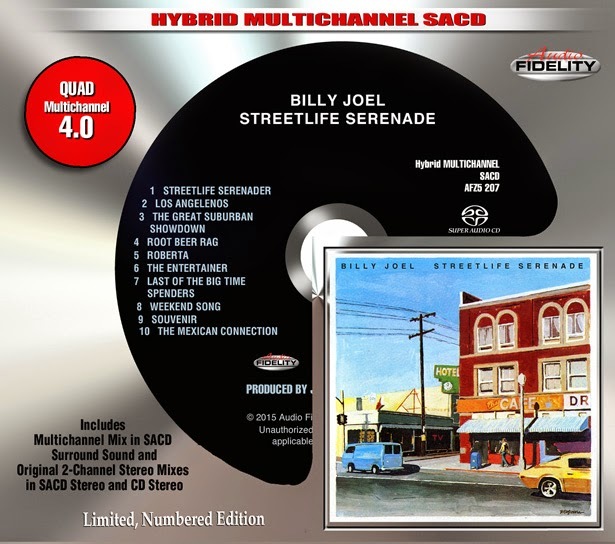 RETRO KIMMER'S BLOG: BILLY JOEL'S STREET LIFE SERENADE ON QUAD HYBRID SACD! BILLY JOEL'S STREET LIFE SERENADE ON QUAD HYBRID SACD! Camarillo, CA – Much to the excitement of Billy Joel fans worldwide, Marshall Blonstein's Audio Fidelity will be releasing Streetlife Serenade on 4.0 Quad Multichannel Hybrid SACD. Billy Joel is an incomparable musician, having sold more than 150 million records, he ranks as one of the most popular recording artists and respected entertainers in the world. Streetlife Serenade is Joel's third studio album originally released in 1974. This album usually gets overlooked when discussing Billy Joel's career, but all these years later, Streetlife Serenade may rank as one of his finest efforts. Joel keeps things lively and diversified from song to song. “The Great Suburban Showdown” and “Last of the Big Time Spenders” have an openly spaced, laid-back western vibe, not unlike what the Eagles were doing during their 1970s heyday. The spunky instrumentals “Root Beer Rag” and “The Mexican Connection” show off Joel's formidable piano-playing skills and are pure fun. “Weekend Song” is an awesomely rugged rocker and the quirky hit “The Entertainer” is sheer pop genius, both lyrically and sonically.